Become the guitar player you have always wanted by having fun playing real music you know and love. If you are looking for guidance and motivation to help you succeed at playing the acoustic or electric guitar, then we want to help you. We offer guitar lessons at both our Medford and Wakefield locations. 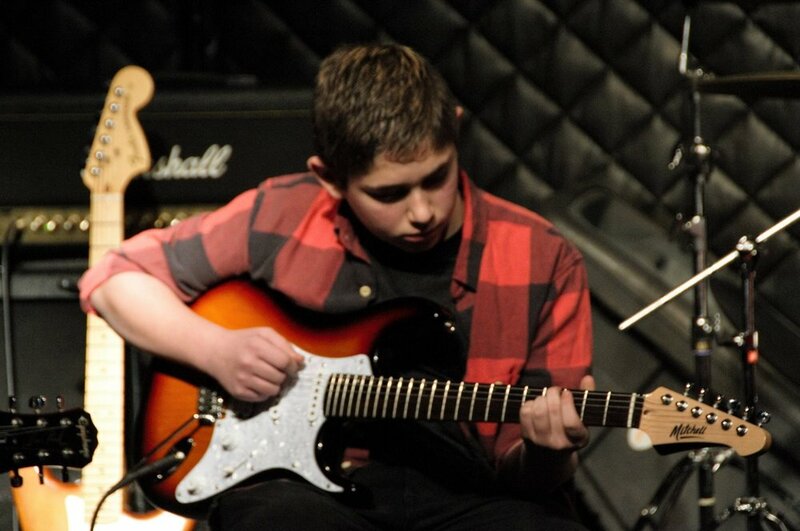 We offer guitar instruction to students ages 7 & up in the styles of Pop, Rock, Blues, Jazz, Country, Folk and Metal. Whatever style of guitar you want to learn, we will pair you with the best teacher to meet your needs. We teach absolute beginners as well as advanced students who have been trying to learn on their own for years. No matter your skills level, we will find a teacher to help you get to the next step. Learning guitar does not have to be hard. I should know, I wasted years trying to learn to play guitar on my own. Leaning to play music should be enjoyable and easy. Our approach to learning electric and acoustic guitar ensures that you are learning exactly what you need to learn at the right time. We like to balance musicianship with having fun because that’s what music is supposed to be….fun. You will learn to play guitar faster than on your own via instant feedback on your playing. You will learn how to practice for better results. You will learn the right things, in the right order, at the right time. You will have opportunities to meet and play with other musicians. You will learn to play songs you know and love. LB Music school is very happy to provide guitar lessons to Medford, Malden, Wakefield, Stoneham, Melrose, Everett, Saugus, Reading, Lynn, Revere and many more surrounding cities. Tell us more about your or your child’s interest in learning to play the guitar using the form in the link below. One of our staff members will get in touch with you to answer your questions and tell you more about how we can help you or your child succeed with voice lessons.